Given the current surge in nostalgia for the 80s, it’s a good time for Hulu to reintroduce the world to Square Pegs. From 1982, the show centers around two geeky high school girls trying to fit in. 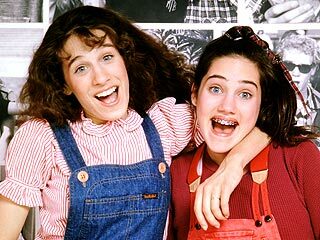 It stars Sarah Jessica Parker, even before Footloose and Girls Just Wanna Have Fun. Her co-star is Amy Linker who, according to IMDB hasn’t done anything since 1985. What I remember about this show is that the two lead actresses were on the cover of Dynamite magazine. Anyone? Dynamite magazine? Lauren’s superior knowledge of who’s who gives the audience a chance to learn some names and ranks. The dreamiest guy in school is Larry Simpson. The most popular girl is Jennifer (Tracy Nelson – one of those Nelsons), who has a Princess Diana thing going on. Being popular also means talking with a Valley Girl accent, peppered with ‘like’s and ‘ya know’s. “Gross me out the door” she declares in once scene, prompted by nothing. The pep rally scene also introduces Jami Gertz as Muffy Tepperman, the Patty Simcox of the group, and the token black student, L.D. The latter performs a song-and-dance number with the hideousness only the 80s could conjure. For some reason the kids are dressed like it’s February, but forgetting that, the fashion paints us squarely in the 80s. Not in the send-up way that shows depict the 80s today, but realistically. )Seriously, we didn’t wear Madonna gloves and stirrup pants every day.) There are some really specific references to pop culture of the time too, like to a particular Budweiser commercial. It takes a few scenes to get a feel for the tone of this show. Although it’s a half-hour comedy, it doesn’t feel like a sit-com. It’s single camera, with a lightly used laugh track. There’s a weightiness to it that would be seen in later shows like Freaks and Geeks and My So-Called Life, and still later, Glee. It’s nice to see high school girls drawn as intelligent and articulate, even if they do still turn to butter in the presence of dreamy senior boys. Although Patty is heartbroken to learn that Larry isn’t into her, she responds with, “Larry, you needn’t reproach yourself.” Actually, much of the episode’s humor derives from her intense seriousness. Oddly, we never see any of the characters’ home lives. In a show of this kind, we expect to see fights with parents, rule breaking and groundings. The pilot takes us from the pep rally, to lunch, to gym class, and finally to a school dance. As a side note and further sign of the times, the Waitresses appear as the band playing the school dance. It’s as if the writers are letting us know that school is these characters’ whole world, which is how it often feels at age 14. “My life is over,” Patty observes at the end. And we know her life will end in some little way every week, because that what happens in high school. This entry was posted in 1980s, Comedies and tagged 1980s, 1982, Amy Linker, comedy, geeks, high school, Jami Gertz, nerds, nostalgia, sarah jessica parker, square pegs by meekthegeek. Bookmark the permalink. Great article! We love these two silly girls, and that entire series. One of our favourite flashback shows!